Will drought conditions hamper Australia's cotton prospects? When it comes to cotton, Australia has a significant competitive advantage that may only increase in the years ahead: Many of its crops meet stringent environmental certification standards. However, restricted water supplies threaten to reduce the sector's production. Could water treatment alleviate shortages in this vital resource? Why is there such great potential in Aussie farmers' cotton crops? The industry already exports the vast majority (94 per cent) of its output, and recent commitments on the part of major clothing manufacturers are likely to fuel demand for eco-friendly supplies. As part of their sustainability efforts, apparel industry leaders such as H&M, Nike, Li Ning and the adidas Group have announced their intentions to source exclusively more sustainable cotton by 2020. This category includes crops that are grown with little or no fertilisers or pesticides. In Australia, the cotton growing industry's representative group Cotton Australia signed an agreement to market cotton grown under the myBMP as Better Cotton – a key component of the efforts pursued by the apparel industry. Therefore, cotton could be a promising commodity for the Australian economy. However, water shortages may threaten output levels, with Cotton Australia projecting the production to slump as much as 50 per cent next season due to ongoing drought conditions. The industry group estimated output would decline from about 4 million bales this year to between 2 million and 2.5 million bales in the 2014-15 season. Similarly, the Department of Agriculture downgraded its predictions for the crop in September, forecasting the area planted to cotton would decrease 28 per cent to 282,000 hectacres. 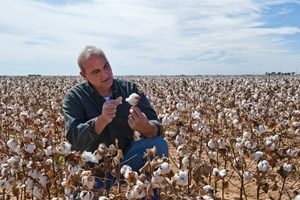 According to Cotton Australia, better water management has helped boost yields in the past. While not all bore sources provide optimal water quality, leveraging an effective water conditioning system could provide some relief. Hydrosmart is especially suitable for adhering to environmentally sustainable production because it functions without adding any chemicals to the water supply.